Applicants to Hellenic College Holy Cross are committed to faith, education, and service and have a special interest in developing personally and professionally in preparation for serving the Church and society. This commitment to spiritual growth and human service unifies the diverse student population at Hellenic College Holy Cross. Applying Early Action allows a student to move forward in the admissions process much sooner than other students. Students accepted through Early Action will receive an additional grant from our Early Action Endowment Fund and can enjoy their senior year without much of the undue stress and pressure of the college decision process. Applications submitted under the Regular Decision Admission will be reviewed on a rolling admission basis. HCHC will notify applicants of its decision within two weeks after complete application materials are received. The Regular Decision deadline for Fall enrollment is April 1. Applications received after August 15 will be considered for the spring semester. 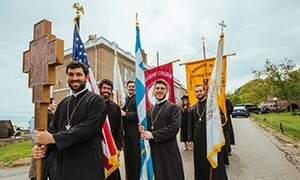 Hellenic College Holy Cross accepts students of all races and creeds. Qualified first-year and transfer students are admitted on a rolling basis for Fall and Spring enrollment. In evaluating applicants for admission, the Admissions Committee implements a holistic process. Admission is based on each candidate’s academic record, application, personal essay, recommendations, interview, extracurricular activities, and test scores. Submit a $500 deposit to confirm enrollment and residency ($250 if you plan to commute to campus). We accept the following methods of payment: check, money order, or credit card. You can either mail your enrollment form (located in your acceptance packet) and a check to the Office of Admissions (check made payable to Hellenic College Holy Cross) or contact the Bursar at 617-850-1272 to process your credit card payment over the phone. Contact Michael Kirchmaier, Director of Financial Aid and Scholarships, to discuss your finalized Financial Aid award letter, as well as scholarship opportunities. Interested in learning more about life at HCHC? Attend an upcoming Admissions event!